Wait, Weep and Be Worthy? I sacrificed my long lie this Saturday to attend an exciting symposium at Glasgow Women’s Library which was part of the Being Human Festival. Was it worth crawling out of bed a couple of hours earlier? Absolutely! The title of the event was ‘Wait, Weep and Be Worthy? Women and the First World War’ and the programme was jam-packed with top class speakers – it was a no-brainer to sign up for this free event. The aim of the symposium was to explore the often neglected role of women during the First World War and its immediate aftermath. The day kicked off with a presentation by Angela Smith on ‘The Impact of the First World War on the Campaign for Women’s Suffrage’’ followed by Martin Goodman on ‘Women as Carers in the First World War’. Both speakers were excellent and with stories and images of key figures from the period such as the Pankhurst family, Elise Inglis, Ruth Farnam and Nancy Astor they brought the issues to life. Kate told us that it became something of a joke in the British army that when she arrived on the scene, the soldiers knew they were in trouble. Flora Sandes was the only British woman officially to serve as a soldier in WW1. For me, the highlight of the day was Kate Adie, who has blazed a trail for women in journalism as Britain’s leading female war reporter. Years ago I heard Kate speak about her media work and I knew she’d be superb and once again she had the audience hanging on her every word. She recounted her time in Serbia when she came across the story of a heroine named Flora Sandes and commended women like her for stepping out of their comfort zone to play a major part in WW1. When Elsie Inglis approached the Royal Army Medical Corps to offer them a ready-made Medical Unit staffed by qualified women, the War Office told her “Go home and sit still”. But the French government took up her offer and established her unit in Serbia. After a lovely lunch I joined a group of women for a creative writing workshop with Zoë Strachan and Louise Welsh. We were asked to consider the type of women we’d heard about that morning and how their stories might inspire us to create a character who might write a letter about their experience in the war. This exercise helped me to reflect on my next writing project and the impact of the Siege of Leningrad on women. I wasn’t able to stay for the rest of the day’s programme but I left with a lot more knowledge of the role of women in WW1 as well as ideas to explore in my own writing. That’s what I call a satisfying and successful Saturday! 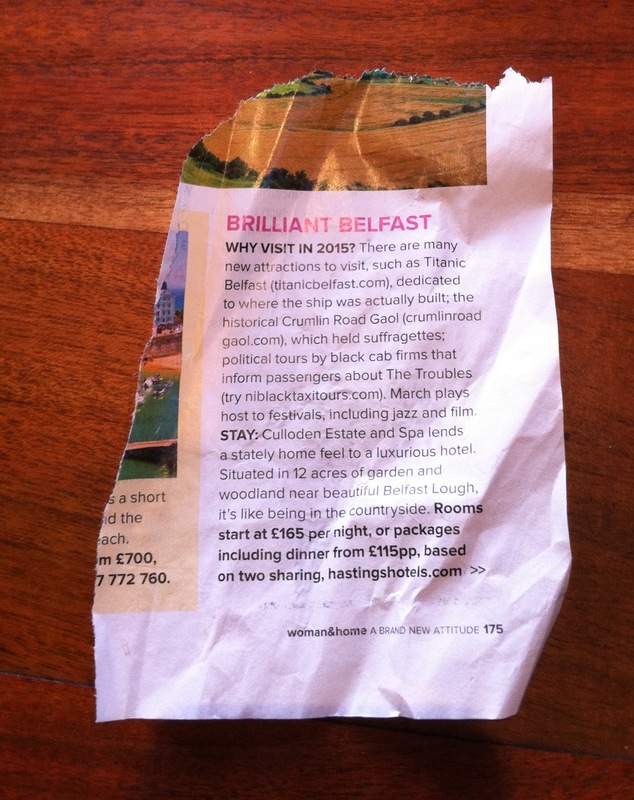 I like to read magazines in the bath and I love to travel which meant I presented my hubby with a page torn out of Woman and Home suggesting that we go to Belfast for my birthday (a much safer option than leaving him to choose a gift!). I’d never been to Belfast and after doing a bit of research I created a wish list of places to visit. 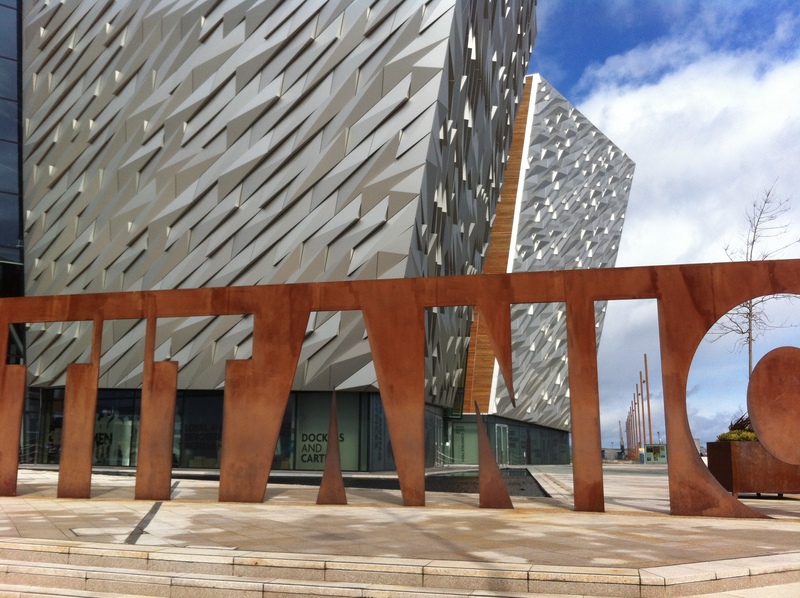 The much hyped Titanic Belfast visitor centre was a definite ‘hop off ‘on the sightseeing bus tour but two other attractions were higher on my list. 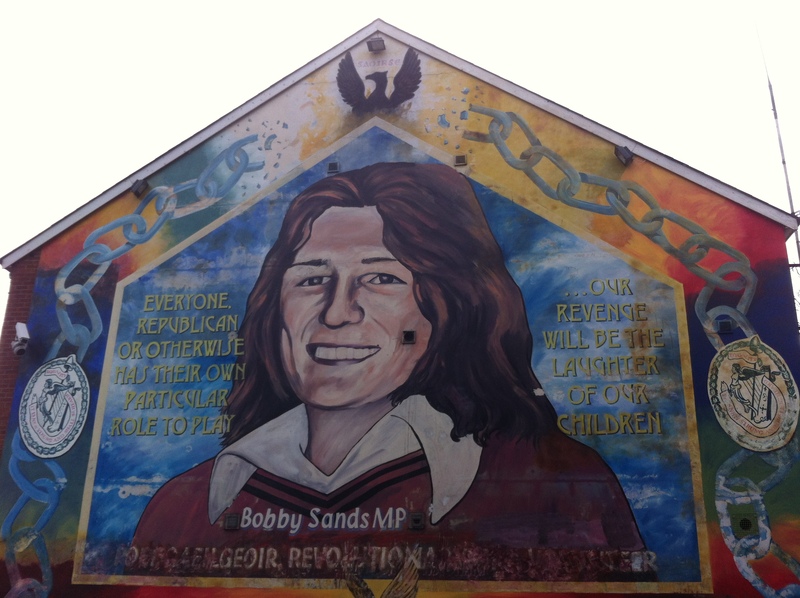 The iconic memorial mural for hunger striker Bobby Sands. 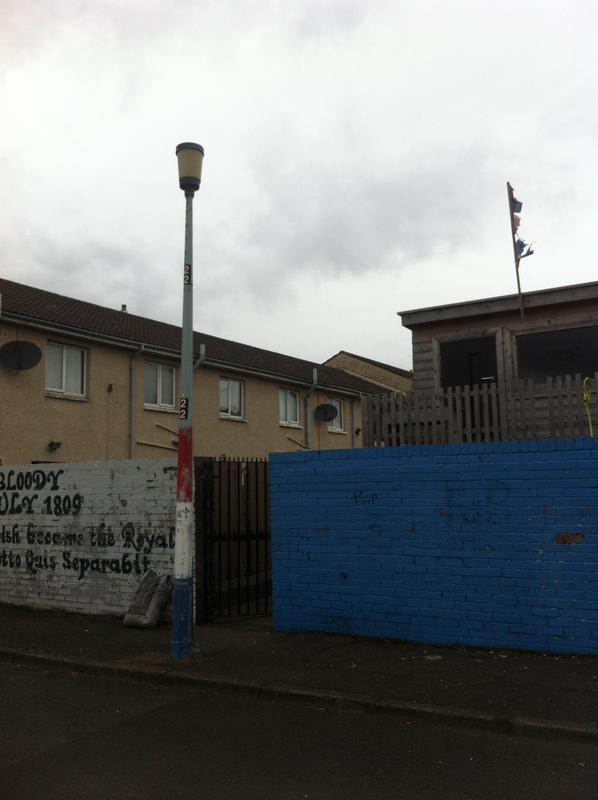 A tattered Union Jack flag on a resident’s shed and a lamppost painted in red, white and blue. I wanted to go on a ‘black cab tour’ of west Belfast to view the mural art and learn more about life for the residents of Shankill and Falls Road before and after ‘The Troubles’. 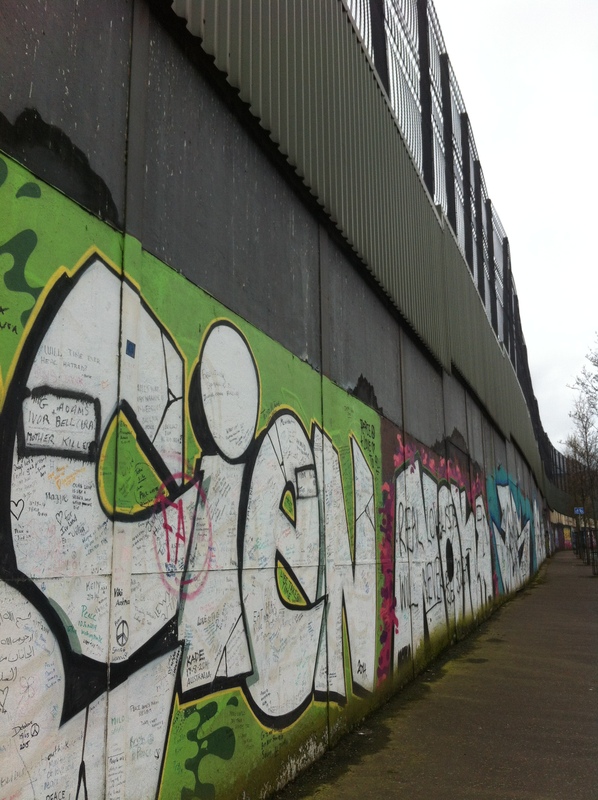 Barack Obama told a crowd in Belfast: “There are walls that still stand, there are still many miles to go”. This was particularly relevant to me as only the week before I’d attended the Glasgow Women’s Library’s Mixing the Colours conference which celebrated the work to address the issue of sectarianism. This is a recurring theme in my own writing so I was interested to learn more about Belfast’s history of sectarianism and how the communities are working to stamp it out. A chance to make my mark in support of Mixing the Colours. As Bobby our driver highlighted, “one man’s terrorist is another man’s hero” and it will take time and effort to battle against sectarianism. 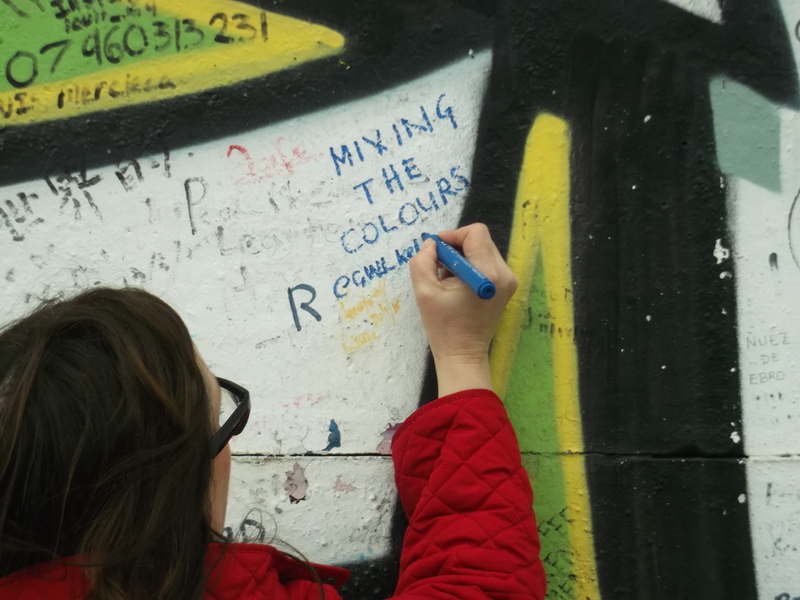 As part of the tour, we stopped at the Peace Line and Bobby suggested that we join others and write our own message on the wall. 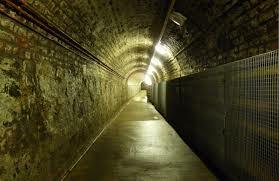 The tunnel that connects the gaol with the courthouse on the others side of the road. 4 wings of the prison radiate from the ‘Circle’. The other tour I wanted to squeeze into our short trip was to Crumlin Road Gaol. The building, known as ‘The Crum’, first opened its gates in 1846 and for 150 years it was a fully operational prison, only closing its doors in 1996. 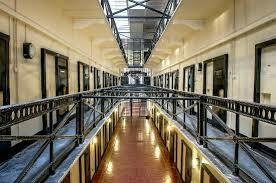 During its history, the gaol housed murderers, suffragettes, loyalist and republican prisoners. I’ve just finished reading the excellent book, The Hourglass Factory by Lucy Ribchester and this features the struggle of the suffragettes, some of whom were force-fed when they went on hunger strike in jail. This happened in Crumlin Road Gaol as well and the tour really helped bring scenes in the The Hourglass Factory alive. Touring a Victorian gaol and a deprived area of a city ravaged by religious and political hatred might not be everyone’s ideal birthday treat but I thoroughly enjoyed my chance to understand more about issues that are important to me (and there was plenty of time for good food and drink too!). 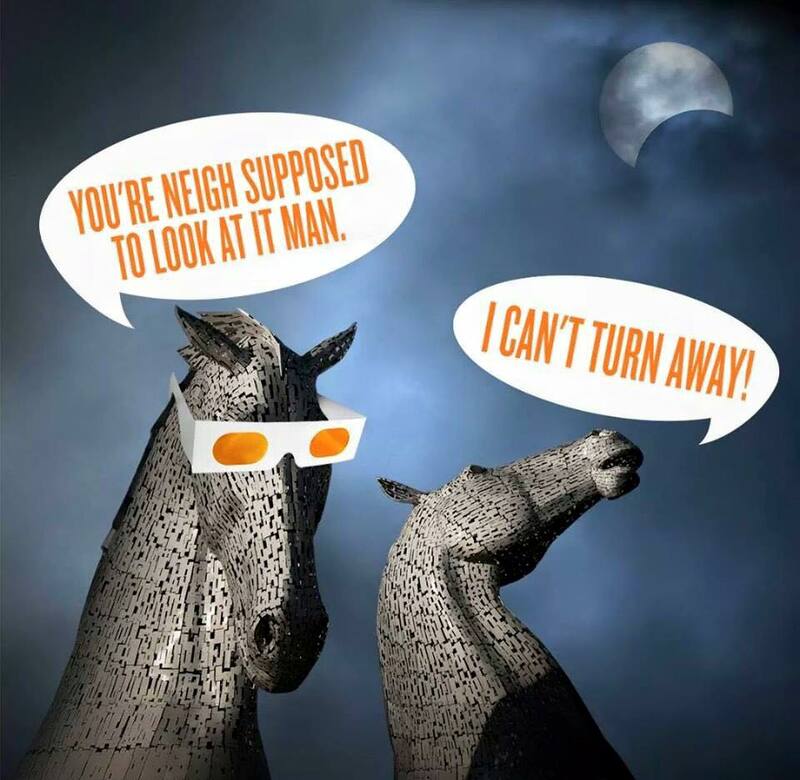 The last time Scotland experienced a solar eclipse was in 1999 and I’ve no idea where I was at the time. But I doubt I’ll forget the eclipse I witnessed on Friday morning. Luckily, I had time to pause on my way to the Mixing the Colours conference so I joined the crowds gathered in George Square. For a matter of minutes a gap in the clouds appeared and a cheer went up in honour of the eclipse. It was a memorable start to the day and the buzz continued during the conference. I’m a huge supporter of the Mixing the Colours project and attended one of their writing workshops at Glasgow Women’s Library to encourage women to write about their experiences of sectarianism. I have been the victim of sectarianism and it’s a key theme in my debut novel, Talk of the Toun, so the workshop stimulated me to write a short story very loosely based on childhood experiences. 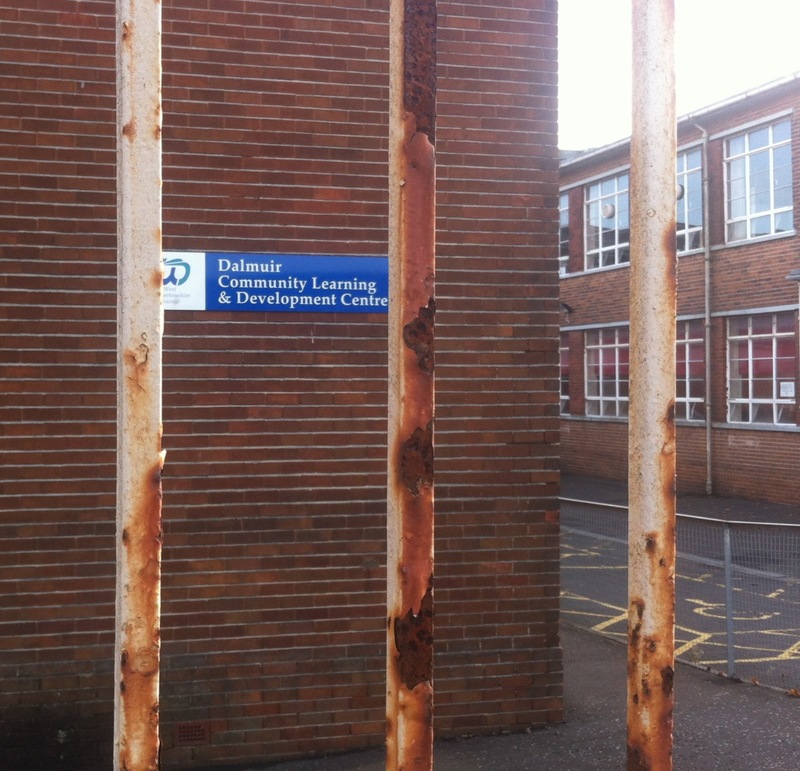 As part of the GWL project, I was chuffed to bits to be asked to record my short story for a podcast for GWL. You can listen to my piece, Smelly Catholic, here. The conference was a great opportunity to present the project’s findings through a Knowledge Café exploring sectarianism in the context of wider gender inequality, presentations by Mixing The Colour’s Project Development Worker, Rachel Thain-Gray, Rosie Kane and Dr Margaret Malloch of Stirling University as well as a premiere of the Mixing The Colours film and the launch of the anthology of short stories and poems. For me, the highlight of the day was hearing readings from other women writers, especially my friends, Ethyl Smith and Emma Mooney whose writing was entertaining as well as thought provoking. Pieces by Julie Robertson, Leela Soma and Marie-Therese Taylor also inspired me and I also enjoyed Magi Gibson’s performance of her specially commissioned Mixing The Colours – A Dramatic Monologue, and a poem by Nicola Burkhill which could be a new anthem for women speaking out about sectarianism. You can watch Nicola perform her poem here – it’s a powerful piece! 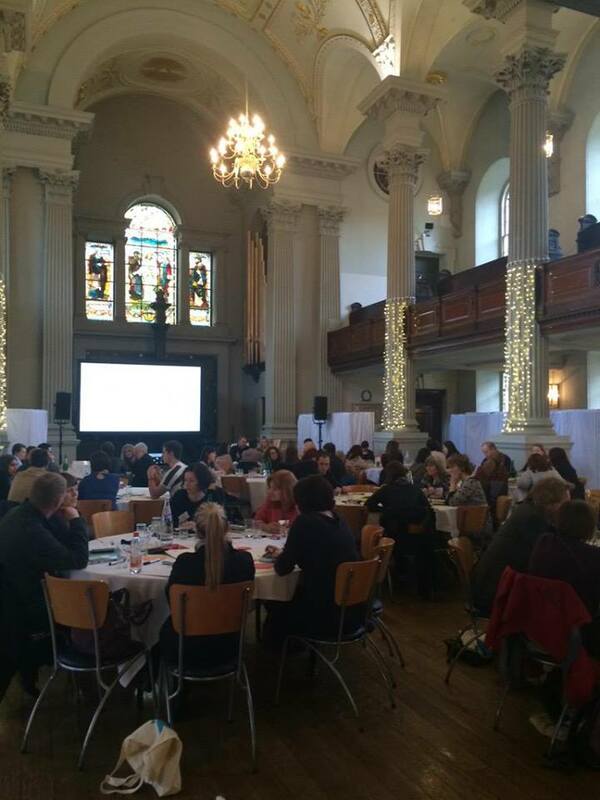 The day of collective action against sectarianism highlighted the need for the inclusion and engagement of women in dialogues around sectarianism in Scotland and I felt privileged to play a very small part. Have you used your writing to explore sectarianism? 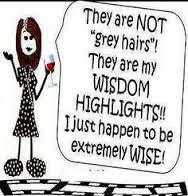 I’m fighting a losing battle but every eight weeks, I take myself to the hairdresser to banish the grey roots, for another wee while… I’m not ashamed to admit that while I’m there I like to flick through Heat and Closer to see what the celebrities have been up to since my last visit. But I’m more interested in the lives of real people, the ones that aren’t rich and famous. The folk that you walk past in the street without a second glance and haven’t had their lives airbrushed and edited. Minus an injection of Botox, these well lived-in faces carry stories in every wrinkle and laughter line. 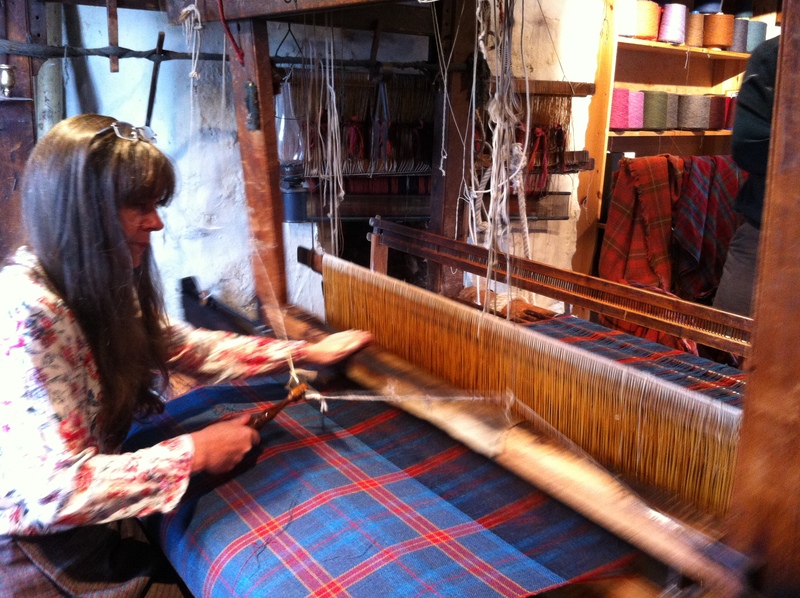 It’s rare that ordinary folk have their stories recorded for future generations and that’s why oral history is so important in making sure these tales aren’t lost. I’m a big supporter of gathering stories from working class people and in particular from a woman’s point of view. That’s why I was keen to go along to the Women Making History Group in West Dunbartonshire organised by Glasgow Women’s Library (GWL) to find out more about the project and to meet a very special woman who is a key member of the group. Never let it be said my research trips take me to exotic locations! 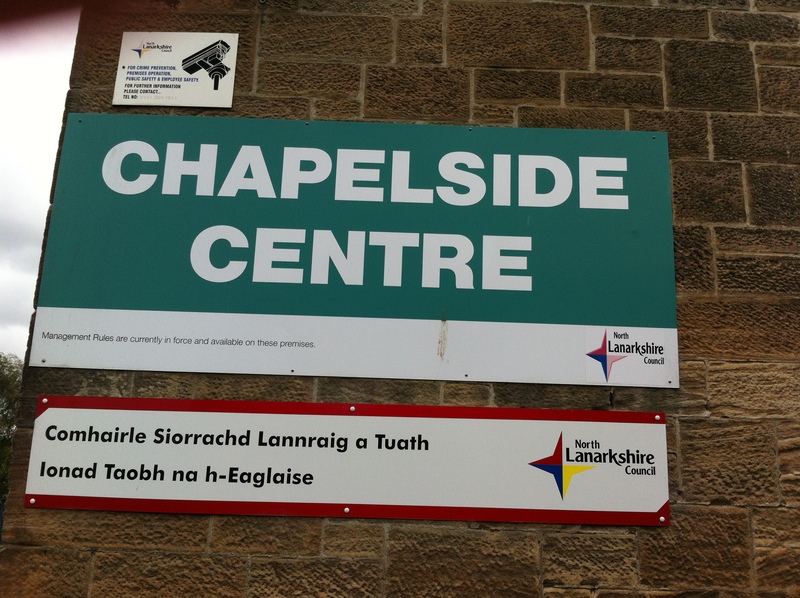 I travelled to deepest darkest Dalmuir to the Community Centre and received a really warm welcome by Lorna Stevenson who skillfully facilitates the group. The group’s aim is to research and document the life histories of ordinary local women throughout West Dunbartonshire with a focus on the theme of their ‘social lives’ and showcase these through the development of two unique community and educational resources in the form of a Memory Box and an A5 booklet. It was great to hear about their plans to source archive material and record their stories. I think a memory box is a brilliant idea for every family to contribute to and pass on to the next generation to keep their history alive. 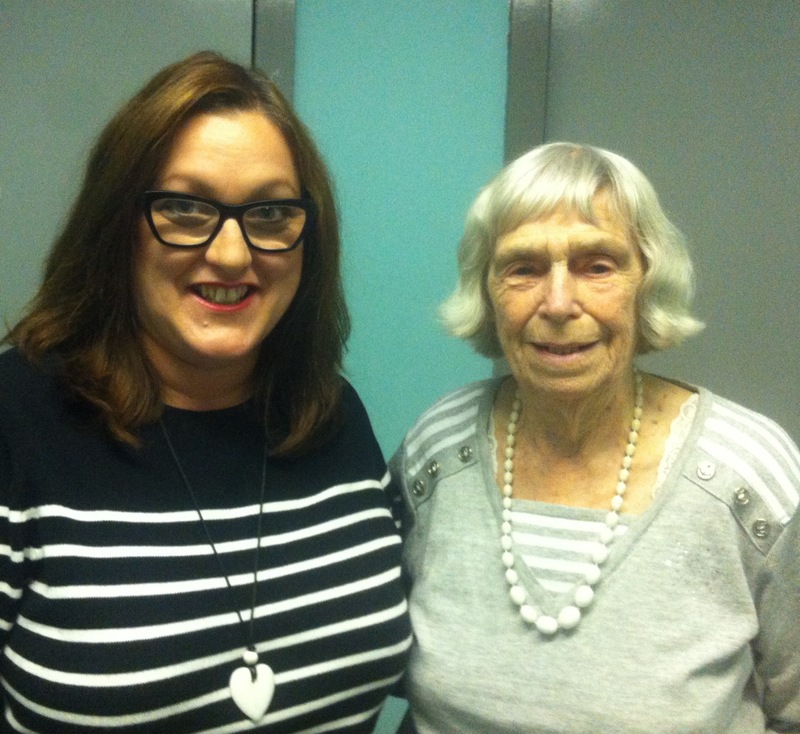 This is the type of celebrity I prefer to meet – Violet is a local legend! I love history and have a fascination for Russia. That might help explain why the idea for my latest writing project highlights the Siege of Leningrad within a contemporary setting but also weaves in a local event in social history. A few months ago, I read an article in the Herald magazine featuring GWL’s Badges of Honour exhibition in which Violet McGuire’s Scotland USSR Society badge was part of the display. I knew that it would be really valuable for me to speak to Violet and thanks to GWL, I got the chance to chat to her about her connection to Russia. Violet is an exceptionally interesting woman who has traveled many times to Russia and I could’ve listened to her talking for hours. I felt very privileged to get the opportunity to speak to Violet who will be 92 years old in December and has a better memory than me. The work of GWL in saving Violet and other women’s stories is important in helping to stitch together the rich tapestry of social history and they do an amazing job on a very limited budget. My dad died suddenly aged 62 and I wish I’d written down the stories of his childhood but feel in some way comforted that stories like Violet’s won’t be forgotten thanks to GWL. Have you ever created a memory box? Have you recorded or written down family stories? 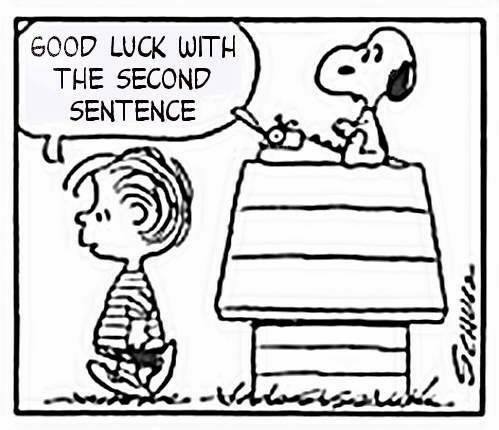 I took a break from writing during the summer and thought it would be like flicking a switch when I decided to tackle my idea for a fourth novel. I was wrong. The routine I’d established was gubbed. 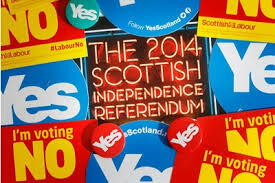 I also felt very emotional and unsettled about the referendum for Scottish independence and it meant that I found it difficult to concentrate on anything other than the news. Instead of writing, I got sucked into reading blog posts, newspapers, watching and attending debates in the run-up and aftermath of the vote. By the end of September, it was time to say ‘No thanks’ to faffing around and ‘Yes’ to making a proper start on my idea for a fourth novel! 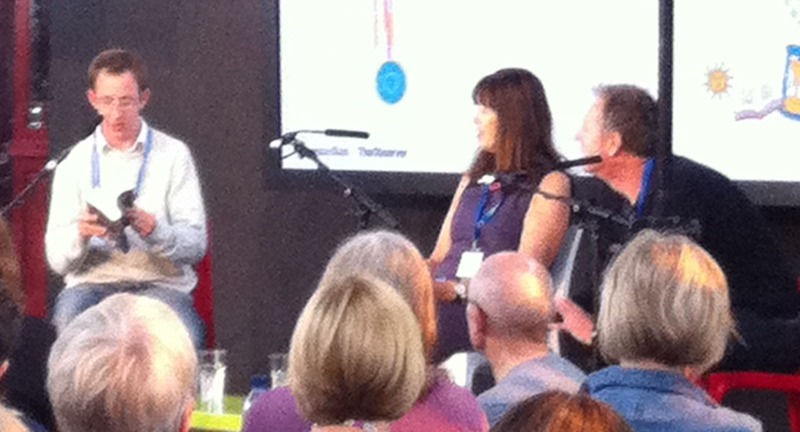 But I needed some inspiration to get me fired back up again and I found it by going to three excellent writer events. 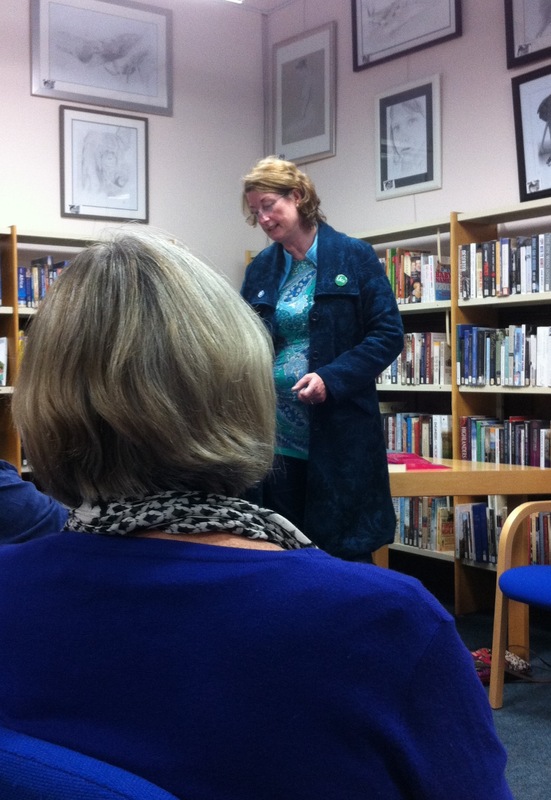 As part of Stirling’s Off the Page book festival, Laura Marney was appearing at Dunblane library. I’ve read all of Laura’s previous books and had heard her read once before, so I went along expecting it to be a good night. I wasn’t disappointed. 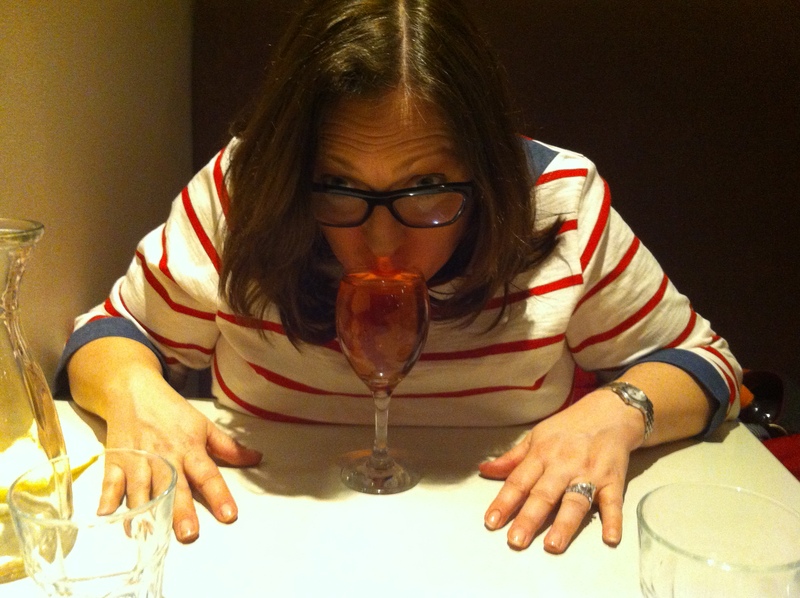 Laura is a very bubbly and vibrant personality; she talks 100mph and could easily be a stand-up comedienne. 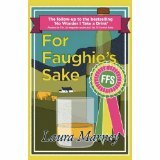 The book she was promoting – For Faughie’s Sake is the sequel to her debut novel – No Wonder I Take a Drink and sounded just as funny and interesting, especially with its referendum theme. Listening to Laura’s enthusiasm for writing was infectious and it gave me a much-needed nudge to get back in the saddle. 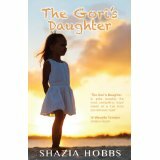 Another source of stimulation was when I visited the Glasgow Women’s Library to hear Shazia Hobbs read from her debut novel – The Gori’s Daughter. Although the book is described as fiction, it’s clearly based on Shazia’s own upbringing as a mixed race woman who battled against the rejection and hostility her background generated in both Glasgow’s white and Asian communities. Shazia’s account gave me an insight into a world I know nothing about and I was moved by her honesty in sharing painful memories. The third event I went to was at the C.C.A. 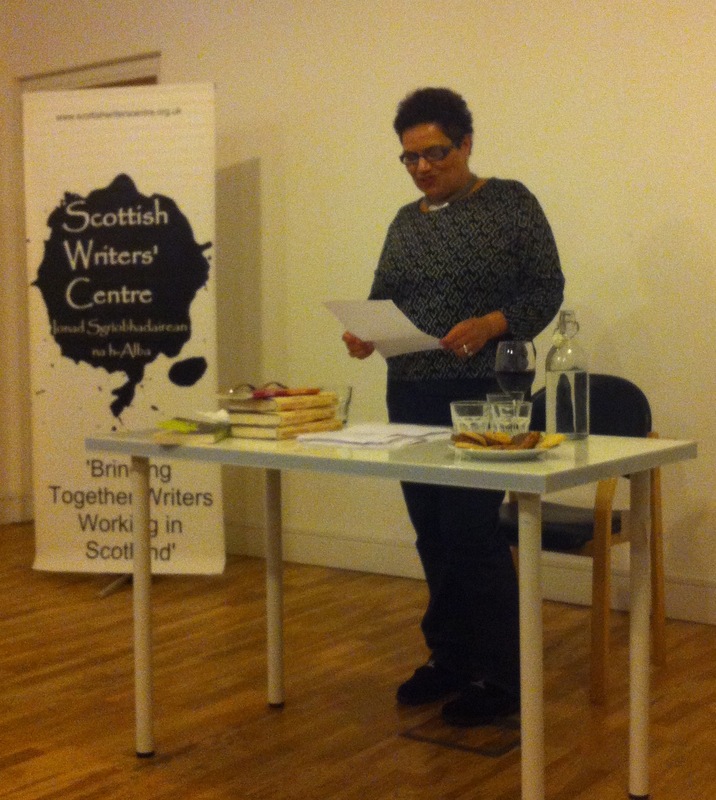 in Glasgow and was organised by the Scottish Writers’ Centre where Jackie Kay gave an ‘In Process’ masterclass. 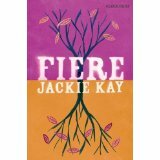 Jackie is one of my favourite writers and to hear her speak again is not only inspiring, it’s entertaining too. 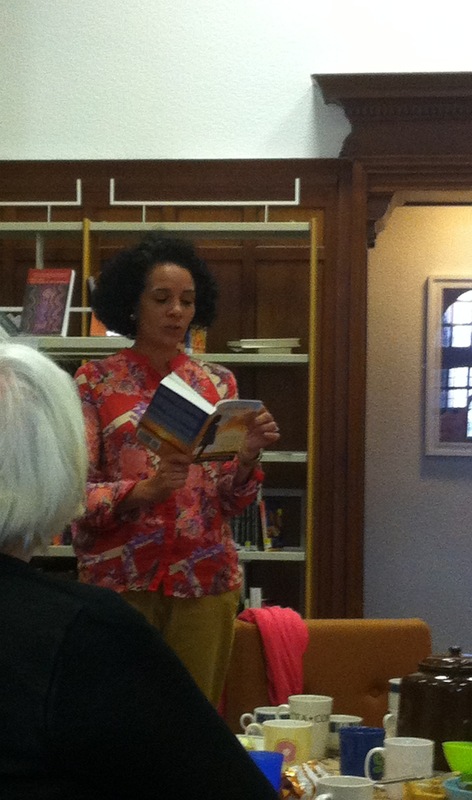 She read from her memoir, Red Dust Road and a few of her poems from Fiere as well as sharing her writing hints and tips. As I’ve recently been struggling with the opening chapters of my new novel, Jackie’s advice for those writers who work across forms was that rather than forcing your way through a traffic jam of words, change direction and work on something different. Whilst writing her latest novel, she’s adopted a strategy of as she calls it, ‘crop rotation’ and rests the novel while she writes poetry. I’m going to take her advice and park up my novel to write some flash fiction or a short story if the words don’t flow. How do you keep yourself inspired? Are you guilty of faffing and how do you battle it? It’s back to school for me this week as one of my day jobs involves teacher training. 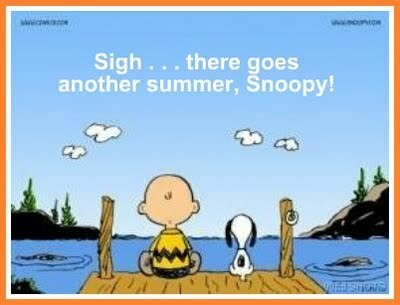 It’s hard to believe that the summer break is over and I’ve not worked for six weeks. But I’ve not been idle! Challenges like NaNoWriMo where writers attempt to rack up 50k words during the month of November and with many writers setting themselves a daily target of 1000 words, this would suggest that as I was ‘free’ for most of the summer, I could easily have written half a novel. So what was my final total? A big fat zero. 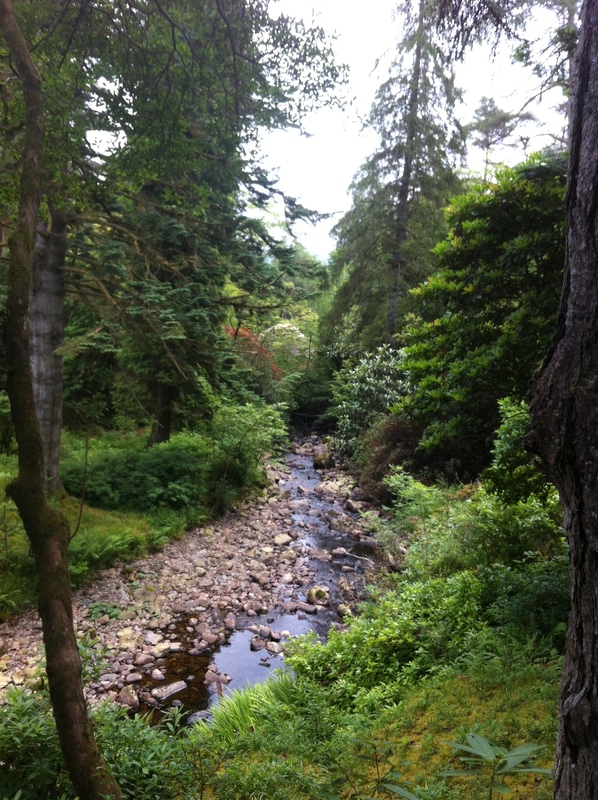 I made no effort to write anything new as I was too busy enjoying summer, just like my Twitter pal, Catherine Noble who blogged recently that she too felt the need to relax and get “oot and aboot”. 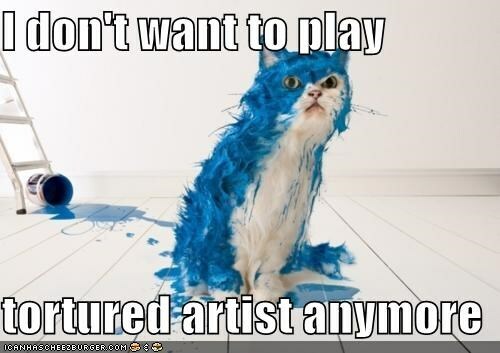 The life of a ‘tortured artist’ is not for me. This summer, the weather has been great and I wasn’t going to miss it stuck inside tapping away on my laptop. Once the darker nights return, I’ll be happy to stay cosy and hide away with my next writing project. But since the end of June, I’ve been packing as much into my break as possible. 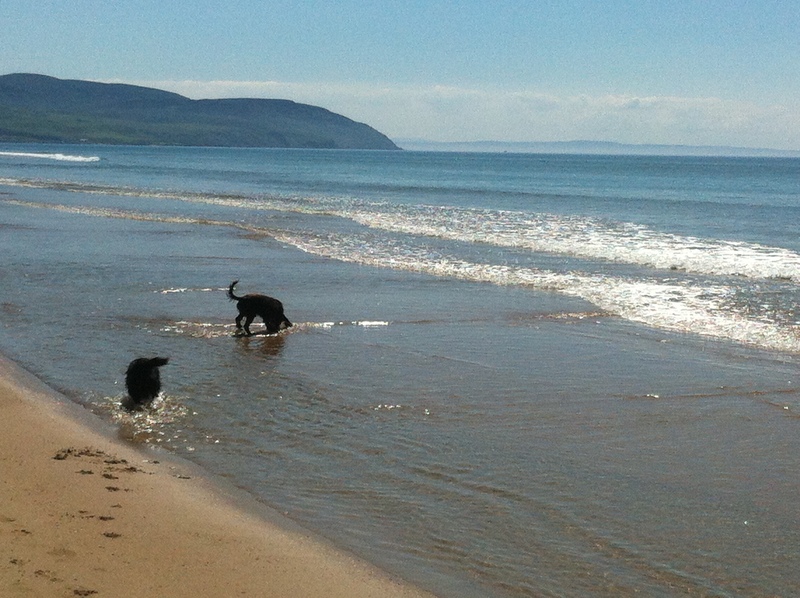 Max & Jess paddling at Westport beach. A tranquil spot at Crarae Garden. 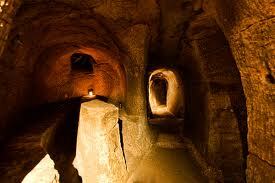 A mysterious series of hand carved passageways and chambers that lie below ground. 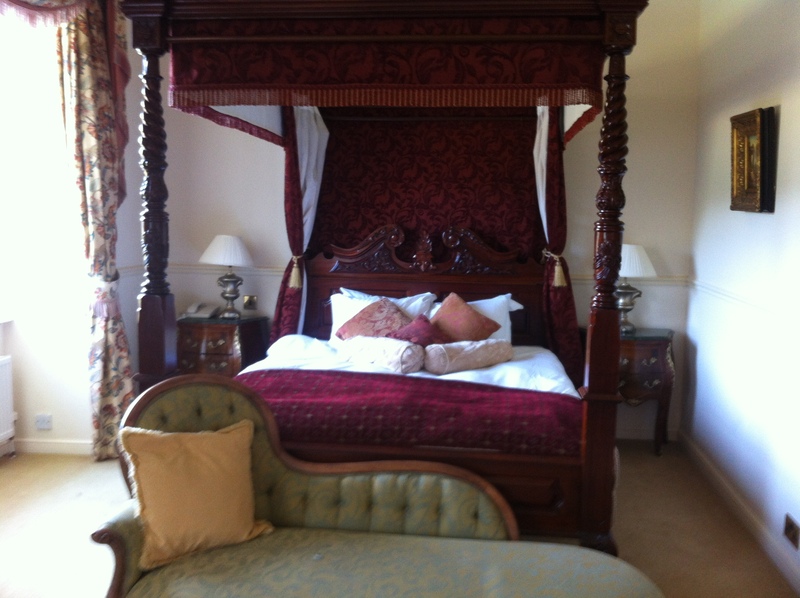 Our romantic anniversary hotel bedroom. 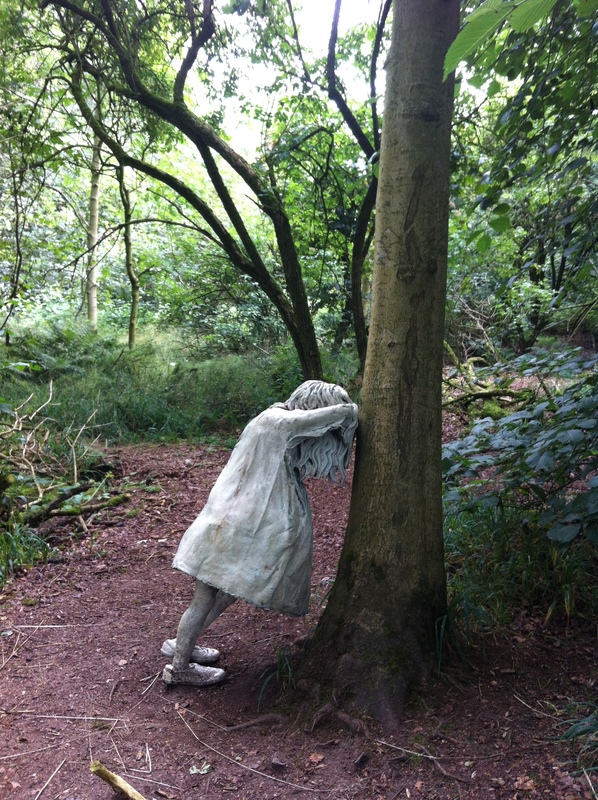 One of the surreal ‘Weeping Girls’ figures among the trees at Jupiter Artland. Total respect for such skill! 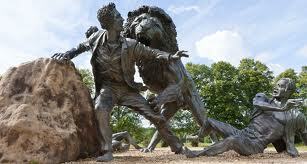 Even being mauled by a lion didn’t stop David Livingstone continuing with his travels – he definitely wasn’t a big fearty! 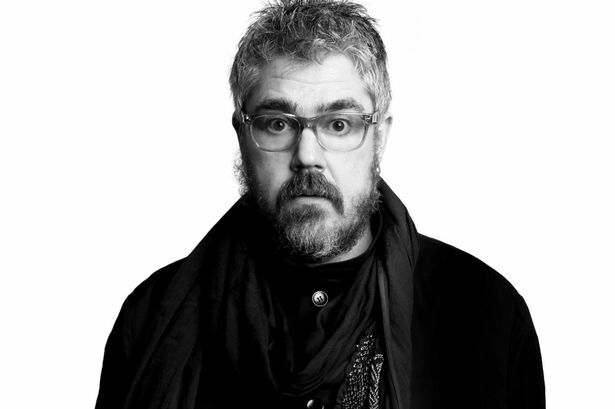 More of a storyteller than a comedian. 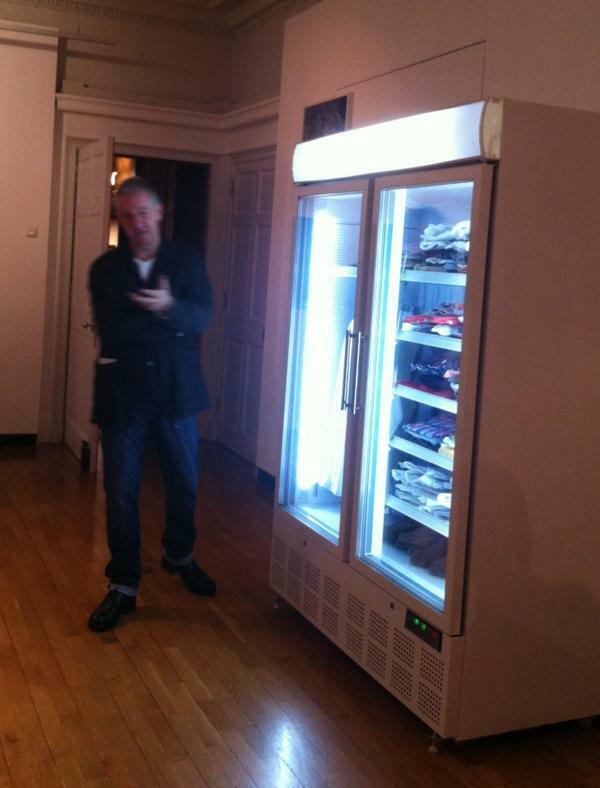 So glad the artist was there to try to explain the ‘art’ of clothes inside a freezer! 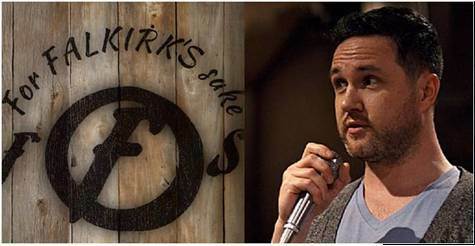 Nathan Filer reads from ‘The Shock of the Fall’ – one of my favourite books so far of 2014. 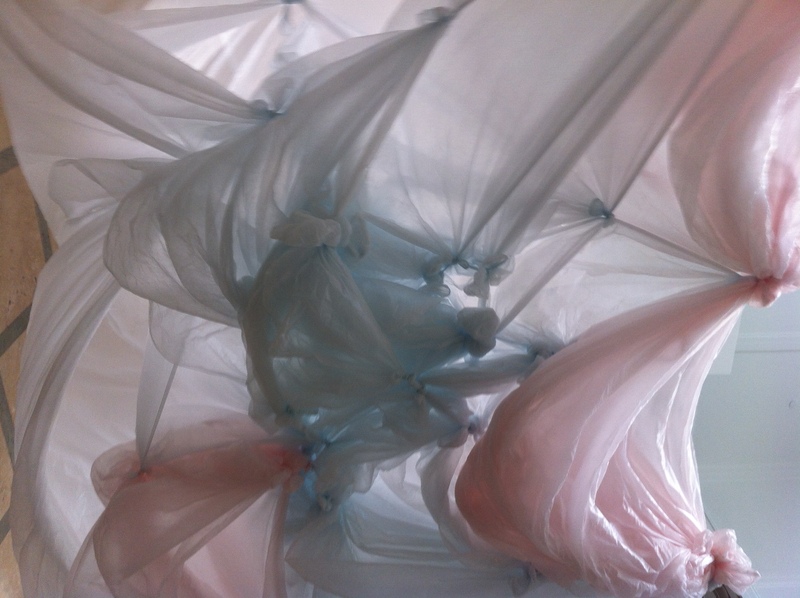 Sheets of knotted polythene as ‘art’ were literally over my head! 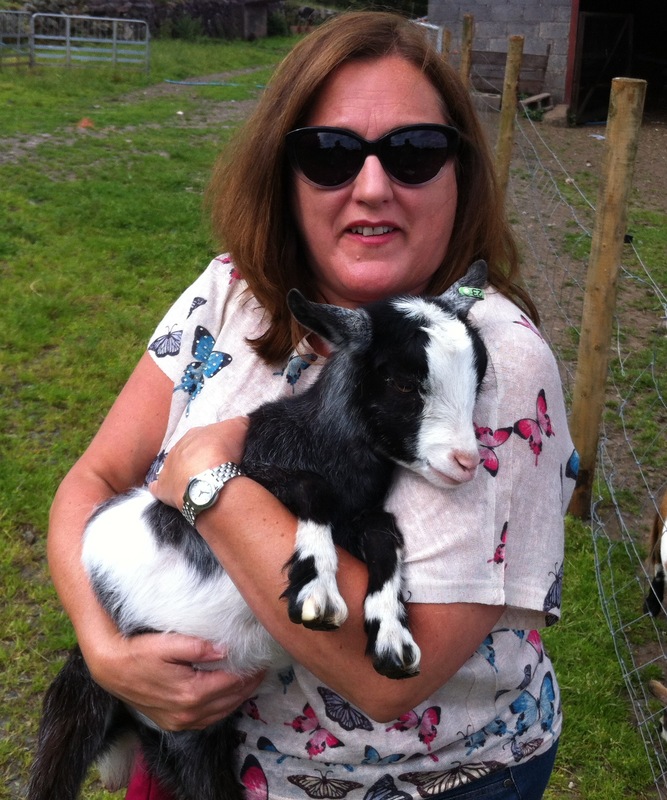 Getting to know Victor, one of the pygmy goats we chose. Who’d guess that inspiration could be found inside? It’s been an interesting summer. I feel it’s really important to do stuff and see things to help feed my creativity. Who knows what will eventually creep into my writing later? But I haven’t completely neglected my writing. I may not have written a new story or started another novel but I’ve spent lots of time thinking through my next project. Possible beginnings and a ‘voice’ have been floating around my mind and I feel almost ready to start, especially after the latest idea involved a trip ten miles down the road to deepest darkest Airdrie for invaluable research. The other writing related highlight of the summer was an invitation to be filmed reading a short story on the theme of sectarianism which I wrote a while back after attending the Mixing the Colours workshop run by Glasgow Women’s Library. I was a bit nervous about being filmed (especially at the thought of the camera adding pounds – something I can’t afford!) but Rebecca Jones from GWL made me feel at ease and said all the right things to boost my confidence. The film may be used as part of a conference being organised by Rachel Thain-Gray next March. It’s a fantastic initiative and one which I’m very proud to play a teeny-weeny part. Has your summer been productive? Do you feel you need gaps between projects?